Stir Up Saturday – Look! Almost Nothing! I was so excited about those figures at the time. I haven’t done anything with them. I didn’t even scan the card like I said I intended to in the post. I should. The card is very cool. Seeing that picture made me take a look at the MUSCLEMANIA section of the site. It dawned on me that I haven’t added the Korean MUSCLEMANIA figures either. I feel like I’m mistreating MUSCLEMANIA. I’m too infatuated with those figures to continue mistreating them like this. I have also seen more MUSCLEMANIA figures on Instagram than I ever expected. I wonder if the collecting pool has jumped from five collectors to 11 or 12? The other thing that happened about five years ago was voting on one of the FLAF figures. We were voting on Figure #5, which became Iron Claw. 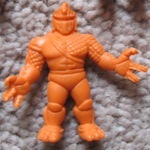 There were only three voting options for this figure: (1) #5; (2) Iron Claw; and (3) Rokon. I don’t think any of the options are terribly strong. Iron Claw won, but it’s not one of my favorite FLAF names. The Iron Claw figure isn’t one of the best FLAF figures, but it seems like he should inspire a little more creativity. The site had so little going on five years ago I started looking back an extra year. What was happening six years ago? And then I had a new experience because Stir Up Saturday has been happening for over a year. I had already done a Stir Up Saturday on the things that had happened about six years ago: Happy Halloween and Boiling Grandma. I won’t revisit those things again. But I will post this for a second time. This entry was posted on Saturday, November 5th, 2016 and is filed under UofM News. You can follow any responses to this entry through RSS 2.0. You can skip to the end and leave a response. Pinging is currently not allowed.